The Rochester Red Wings’ affiliation agreement with the Minnesota Twins ends this year. And while it’s entirely possible that it will be renewed, it’s also entirely possible it will not, as there is some discussion that, with the future of the Twins’ front office uncertain after the firing of Terry Ryan, now may be the time to again switch. This speculation is especially occurring because the New York Mets, one of the most popular MLB teams in the area, will also likely be available in the affiliation shuffle after this year, and the Mets are desperate to get a new affiliate closer to home, as opposed to distant Vegas. While it is true that the Red Wings have not had much postseason success during the Twins’ years, with only two appearances and no titles. However, this forgets that the Wings have been competitive for most of the Twins era and probably would have reached more postseasons if not for the tough IL North division and some bad luck. In 2014, for example, they were not eliminated until the final weekend of the year. 2015 saw something similar, and had the Red Wings finish with the same record as the previous two seasons, including the 2013 year where they made the playoffs. This season may see the Red Wings miss the playoffs despite currently having the third best record in the league. 2. The Twins are a Better Farm System, from a winning perspective. As you can see, the Twins are a respectable 10th place. This is the entire organization, from AAA all the way down to the lowest of Rookie leagues. The Mets, meanwhile, are sub-.500 and are at 19th. And if you go level by level, the Twins have a better team in most of them: The AAA Twins (the Red Wings) have a better record than the AAA Mets (Las Vegas). The AA Twins (Chattanooga) have a better record than the AA Mets (Binghamton). The low-A Twins (Cedar Rapids) have a better record than the low-A Mets (Columbia). The rookie-ball Twins (Elizabethton) have a better record than the rookie-ball Mets (Kingsport). The Twins even have a better record in the Gulf Coast League! The only minor-league level where both organizations have teams and the Mets have a better record than the Twins affiliate is the High-A Florida league. It’s been said that the two biggest determinants of minor league team attendance are also the two things the local GM (in the minors, the GM is more of a business position, not like the position in MLB) has the least control over: how the team is doing, and how the weather is. Except that isn’t really true, as the Minor League team CAN decide who it affiliates with. And when you look at the success on the field up and down the minors, the Twins clearly are the better choice when it comes to wins than the the Mets. 3. The Twins have better prospects overall than the Mets. One of the neatest things about Minor League Baseball is that you can see the stars of tomorrow. And in this case, the Twins have a better case than the Mets. At the beginning of the year, MLB.com listed the Twins as the fifth best farm system in baseball. While obviously this has likely changed as players like Max Kepler and Byron Buxton have headed to the big leagues, it should be noted that the Mets were nowhere to be found in the top ten this year, and another site (which ranked the Twins 8th) put the Mets all the way down at number 20. 4. The Mets probably wouldn’t cause the big attendance boost some people think. My fellow Rochester seamheads will remember the Empire State Yankees. In 2012, as their stadium was being renovated, the Scranton Wilkes-Barre Yankees (now the Scranton RailRiders) played their home games on the road, mostly in Rochester. Before the season, some Yankee fans were declaring that the people of Rochester would love them and support them even more than they did the Wings, that it was a dream come true, etc. etc. Yes, the Baby Bronx Bombers were in town and, with the exception of a Andy Pettitte rehab assignment, they drew flies, despite the fact they had a very good team. And the Yankees are definitely far more popular in Rochester than the Mets. Now, admittedly, the fact that they were the “Empire State Yankees” and not the “Rochester Red Wings, AAA Affiliate of the New York Yankees” probably had a lot to do with it. But when you consider that attendance wasn’t particularly skyrockety for the Buffalo Bisons when they had the Mets affiliation (although to be fair, the Mets system was even worse back then), I think it’s safe to say that in general the affiliation doesn’t drive attendance all that much- winning and weather does. And as I showed with number two and number three, the Twins are a better choice for that. 5. The Mets have horrible owners. Red Wings fans still speak in hushed tones about Orioles owner Peter Angelos. Why, the only people who hate Peter Angelos more than Red Wings fans are Orioles’ fans! GET IN LINE, NATS FANS, THIS SPOT IS TAKEN! Peter Angelos’ interference with minor league operations, general incompetence, breaking of traditions, and favoritism (intentional or not) to other teams in the Orioles’ system (especially the AA Bowie Baysox) led to the end of one of the longest affiliations in baseball. Well, say what you will about Angelos, but to the best of my knowledge he never ended up drowning in debt after being caught up in a massive Ponzi scheme and as a result been unspeakably cheap for his team that was in the World Series last season and plays in New York City. Nor, to the best of my knowledge, has Peter Angelos been sued for firing somebody because she had a baby out of wedlock and then resolved it before it reached trial. And while I’m sure he (like, sadly, seemingly every single MLB owner) would sign somebody who was suspended for domestic abuse, he hasn’t as far as I know. Yet. But you know who has done all of this? The owners of the New York Mets! Now, full disclosure, I own a very small (essentially symbolic) portion of the Rochester Red Wings (I covered this before). Not enough to make a difference, but I do own some. But let’s say I did own enough. Would I want to do business with the Wilpons? 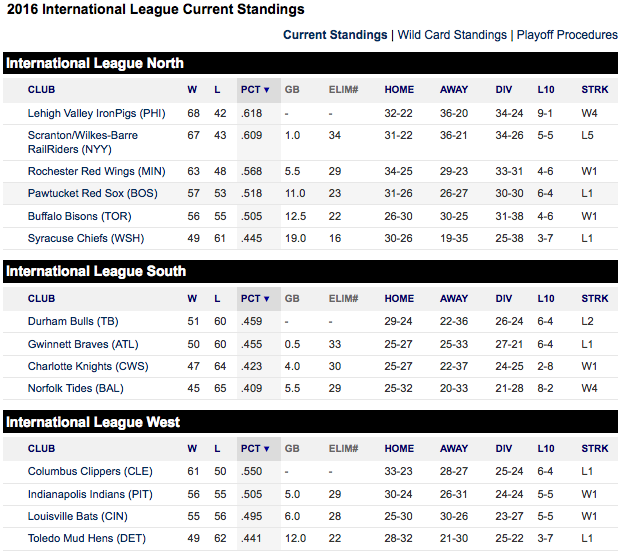 Many minor league teams change affiliation with relative regularity. The Red Wings don’t- they were Cardinals affiliates from the late 20s to 1960, and then spent the rest of the 20th century and the first two years of the 21st with the Orioles. That means that it should still be another decade or two left with the Twins. Perhaps I’m just being a romantic, ignoring the business nature of modern baseball. And, to be sure, if everything was bad and the Red Wings were doing horrible with no good hope in the lower minors, I’d agree that perhaps it’s time to move on. But the Wings have been one of the most successful minor league franchises in history by not changing course at the first sign of trouble, and I see no reason to start swapping every decade or so now. So… I say: stick with the Twins and nix the Mets. The reasons to stay with Minnesota lay in the evidence, and the reasons to go to the Mets are nowhere near as high as they seem. And, besides, if the Mets want to be in Rochester so damn bad, maybe they can call back in two-to-four years. By that point, maybe whoever has replaced Terry Ryan will have shown how he will treat the minor leagues. And maybe they won’t be owned by the Wilpons either. In 30 Teams, 30 Posts, I write a post (of varying amounts of seriousness) about every MLB team in some way in the lead-up to the beginning of the 2016 season. Earlier installments can be found here. Today, I waste time on YouTube watching old Mariners ads. It is one of those generally known facts that the Mariners have some of the best commercials in baseball. I’m not sure where and when this piece of wisdom first came into being, but it exists. So, let’s go back and look at some past Mariners ads, shall we? It is unusual to think in this world where some people spent most of the last few seasons complaining about bat-flips that as early as 2003 there was an ad based upon the fact that Bret Boone had a bat flip. The fact we never got a sitcom about Ichiro living in a small anytown Seattle suburb is greatly disappointing. Also, the idea that Ichiro could throw a ball to Spokane from Seattle (a distance of about 230 miles) is only slightly less realistic than his previous commercial. What’s great about this one is that Jamie Moyer played parts of five more seasons after 2006. I like the devotion to the gag here, but it’s a bit “meh” compared to some of the other ads. I feel like “Ichiro’ing” with lawn equipment would be dangerous. But, hey, who am I to argue? Wait, is that Nick Punto as a catcher at the end? He never played catcher! Worth it if only for the question of what happened to the original L-screen. A) I totally forgot somehow that Cliff Lee and Felix Hernandez were on the same team. B) How did this conversation about two first names get started? I want to know. Worth it if only for Ichiro quoting Indiana Jones. I wonder if they had a giveaway of the ventriloquist doll? I applaud the Mariners for doing the history lesson. It’s the Elvis that does it for me. This would be a better commercial if Robinson Cano didn’t have a (for him) down year in 2015. 2015: Where does it go? I just saw an invisible arrow deflate the bouncy-castle of an Athletics’ fan. Man, why is it always the Athletics? In 30 Teams, 30 Posts, I write a post (of varying amounts of seriousness) about every MLB team in some way in the lead-up to the beginning of the 2016 season. Earlier installments can be found here. Today, I go over other ways that Yoenis Cespedes can arrive at Mets camp. The big story this year in Mets’ camp hasn’t been the pitchers, or the fact they are coming in as defending National League champions. No, it’s been Yoenis Cespedes. He’s arrived in crazy cars and on a horse, when he hasn’t been buying pigs for $7,000 just to eat them. On March 4, Cespedes will arrive in a Aston Martin DB5, like James Bond drove. On March 7, Cespedes and his entourage will go to an All-You-Can-Eat Buffet in Port St. Lucie. They will proceed to eat it out of business. On March 9, Cespedes will fly an autogyro to Tampa, where he will play against the Yankees. He will hit a home run and unleash a massive bat-flip. Certain Yankee columnists will take this the wrong way. It will be glorious. On March 12, Cespedes will arrive at Mets camp driving a go-kart. On March 13, Cespedes will skip the game at the Marlins and instead take a helicopter to Disney World, where he will have a blast. Aware that you should “Beware the Ides of March”, Cespedes will stay inside in his room all day and play video games. From March 17 to 19, Cespedes will disappear to go undercover and takes part in the Arnold Palmer Invitational in Orlando. He will be leading when the Mets find him and haul him back to camp. On March 21, he will arrive at the Mets facility in a DeLorean with Christopher Lloyd, who he has paid to reprise his role of Dr. Emmett Brown. On March 23, he will arrive on a hovercraft. March 25 will see him arrive at the facility in a Harrier jump-jet. March 30 will see Cespedes arrive riding an elephant. On March 31 and April 1, Cespedes will accompany the Mets to Vegas to play the Cubs. He will proceed to break the bank at the Luxor, and then leave Vegas flying a UFO from Area 51. What’s scary is… some of these might actually come true! Karen and I met on New Year’s Eve, December 31, 1985. By May, we were engaged. When Karen started looking for a place to get married near her hometown of Niskayuna, New York, I had one request. It seemed a simple enough request to me. Sure, I wasn’t destined to play in the World Series, but I always watched it and it was very important to me. What I didn’t understand, the flaw in my plan, was that Karen had no idea when the World Series occurred. We were to be married the same day as Game 2 of what would turn out to be the Red Sox – Mets series. “Wait,” she said with surprise. “Isn’t it ‘The Boys of September?’” What can you do? The day before the wedding, my in-laws had a big spread, not a rehearsal dinner per se, but a nice gathering at their house. Everyone huddled around the TV to watch the opener, Bruce Hurst v. Ron Darling at Shea. “Why are they all watching TV?” my mother-in-law wondered, in disbelief. They were doing what was the only normal thing to do, watch the World Series. I left before the game was over, heading back to my hotel with my parents. My mother was ticked off at my in-laws because they didn’t have enough food. Why? My mother told them no one would come from New York City to upstate the night before the wedding. My mother-in-law ordered an appropriate amount of food and then, of course, a horde of New Yorkers came. A nice trap was set by my mother. What did I care? I just wanted to get back to watch the rest of the game, which Boston won 1-0 on a Tim Teufel error. The next day, October 19, was beautiful and sunny, the last pretty day before fall gave way to winter. We had an outdoor wedding, well-attended, and well-remembered. As the afternoon went on, some guests had to leave. They had tickets to Game 2. I couldn’t blame them for the leaving early. Karen and I didn’t leave the wedding together; we didn’t give it any thought. A worker at the hall said to Karen, “I’ve never seen the bride and groom leave separately.” It was no big deal and I had to get my stuff from the hotel. Our honeymoon wasn’t until December. We reconvened at her parents’ house and went to the Desmond Americana Hotel in Albany for the night. At the hotel, in a nice two level room, we opened all our gifts on the first floor and ordered lots of appetizers from room service. Then, like all newlywed couples, we went upstairs to bed. I watched Game 2, a Red Sox blow out. Our anniversary has always revolved around the World Series, though now, with the extra layer of playoffs, the Series is usually the week later. We watch all the post-season games together, I tell Karen about the players, we snack, we drink and we have a blast. Not even the “Boys of September” have a better time. Jeff Katz, author, Split Season 1981: Fernandomania, The Bronx Zoo and The Strike That Saved Baseball (Thomas Dunne Books) is also the Mayor of Cooperstown. You can find him at http://Jeff-Katz.com and @splitseason1981. How you view a particular year or period of time completely depends on your perspective. When you bring up 1986 in the New York Metropolitan area, the first thing that comes to mind is the ’86 Mets. As a diehard Mets fan, 1986 should’ve been the greatest year ever. I became a Mets fan because my Dad saw to it. He did what all Dad’s do to make our sons love the sports teams we love. Basically, he used everything at his disposal. What gave him the most leverage was my love of strawberry ice cream. He used that information to tell me the Mets had this player named Darryl Strawberry who was going to play for the Mets. When Strawberry first got called up in 1983, he brought me to see him play. I was immediately hooked. Right now, I’m using the same tactics with my son to much success even if I have to find him a new favorite player. The reason why I remember that moment was my family was hosting an engagement party for my aunt, who lived with us. Instead of this being the families getting to know each other type of party, it turned into everyone watching Game Six of the World Series. I still remember the way everyone celebrated when that “little roller up the first base line” went through Buckner’s legs. I just remember the sheer joy and elation. That moment as much as anything else may be the reason I’m such a huge Mets fan. I was five at the time. While I only had one memory from the entire 1986 season, I can tell you everything about walking into Nana and Grandpa’s house the day my beloved Grandfather died of throat cancer on a beautiful April day. It was a day in which everyone else was thinking about baseball and a soon to start Mets championship season. It was the beginning of a great year for Mets fans. However, for my family, 1986 was decidedly not a good year. We lost a loved one to cancer. Now, 30 years later the Mets are primed and ready to win another World Series. Over the course of the 2016 season, there will be deaths to mourn, weddings to celebrate, and births that will forever change our lives for the better. Throughout all of it, baseball is there. Baseball is there to help us to get through the tough times. It’s there to share with our children when they are born, and they become Mets fans of their own. It’s part of what makes baseball great. It’s always there for you. So yes, 1986 was a terrible year for my family. However, the ’86 Mets were a reminder that even it times of sorrow, there is still room for joy, for celebration. Mets Daddy is the father of a now two-year-old. His blog, metsdaddy.com, discusses everything Mets with a special emphasis on raising his son as a Mets fan. He can be found on Twitter @metsdaddy2013.